We've got a whole lot of these flowers all over the yard. They grow like weeds. Cut them and stick the stem in moist soil and they almost always "take". 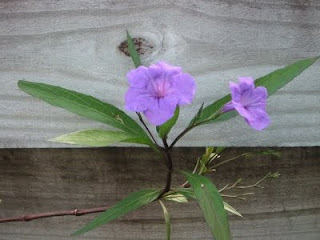 They're called Ruellia or Mexican Petunia. They're also basically weeds but they're pretty. I get annoyed every so often when they try to take over the yard and the Japanese Yew or Podocarpus, but slice them and they always come back. Easy gardening tip in Florida huh?